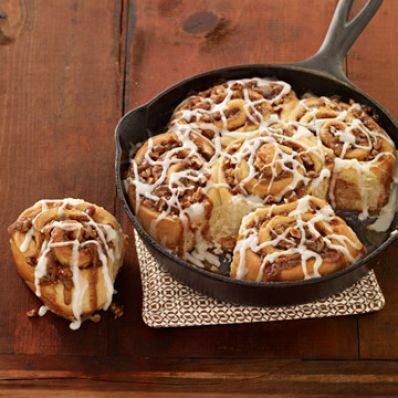 Brunch just wouldn't be the same without these yummy sweet rolls drizzled with white creamy glaze. The filling is enhanced with a layer of pecans and raisins. 1 of 8 Heat the milk in a small saucepan over medium heat until it just begins to boil. Remove from heat and let stand until cooled to room temperature. 2 of 8 Meanwhile, sprinkle the yeast over the warm water in a large bowl. Add 1 tablespoon of the sugar and let stand until foamy, about 5 minutes. Beat in the remaining 2 tablespoons sugar, eggs and butter. Beat in cooled milk. 3 of 8 Gradually add the flour and salt, scraping down side of bowl, until a soft dough forms. Turn dough onto a floured work surface and knead the remaining flour into the dough, adding more flour if too sticky. Knead for about 10 minutes until smooth. The dough will be soft. 4 of 8 Grease a large bowl. Place the dough in the bowl. Cover with plastic wrap and place in a warm spot until doubled in size, about 1-1/2 hours. 5 of 8 Coat two 9-inch round baking pans with nonstick cooking spray. Line bottoms with parchment or waxed paper; coat paper with spray. Prepare Filling: Mix butter, both kinds of sugar and cinnamon together in a medium-size bowl. 6 of 8 Punch down dough. Roll out dough on a lightly floured surface to an 18 x 12-inch rectangle. Spread the butter-sugar mixture over the dough. Sprinkle with nuts and raisins. Starting on one long side roll up jelly roll fashion and pinch seam to close. 7 of 8 Cut crosswise into 14 generous 1-inch pieces. Arrange 7 pieces, cut-side down, in each prepared pan. Cover with plastic wrap and let sit in a warm spot until buns double in size, about 30 to 45 minutes. Or cover tightly with plastic wrap and refrigerate until the following morning. 8 of 8 Heat oven to 350 degrees F. Uncover pans and bake buns until they are golden-brown and bubbly, 30 to 40 minutes. Transfer to a wire rack and let cool 10 minutes. 1 of 1 Mix confectioners sugar and 1 tablespoon of the milk, adding more milk as necessary, to make a smooth glaze. Invert buns to a serving platter. Drizzle glaze on top of buns (about 1/3 cup per pan). Serve warm. Per Serving: 60 mg chol., 7 g sat. fat, 114 mg sodium, 3 g fiber, 79 g carb., 18 g Fat, total, 496 kcal cal., 7 g pro.